Click for Harmony: Piaffe and Passage. I always dreamed that the day would come when I could say that Bella and I had piaffe well in our sights and that day has now arrived! I've continued this for the last couple of weeks, always in the same place (so far) and today I rode her and asked her to do the same from the saddle, in the same spot, and she did! It's only the start of piaffe but it feels great and it's having a tremendous effect on the rest of her ridden work too. She feels so light in hand, so balanced, forward and effortless to ride, she's totally spoiling me for riding anything else! I have noticed, as in the video, that the first time of asking always seems to produce the best steps, so now I stop and do something else after the click rather than asking again immediately, and I'm doing the same ridden and only asking for a couple of steps once or twice to begin with. 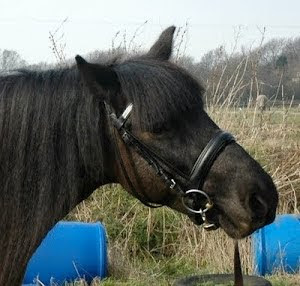 I finished today by doing some rein back to trot transitions and got some really fabulous feeling steps, even for Bella! I need to get a ridden video to see if it looks as good as it feels but it feels as though we're getting pretty close to passage to me! Probably the most exciting thing about all of this is just the way Bella has started to feel in general. 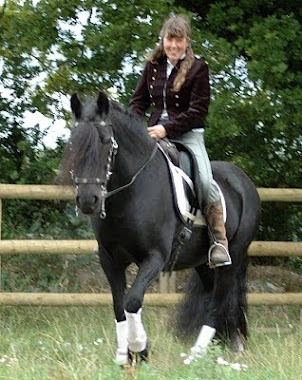 To me, with my limited experience, she feels like a serious dressage horse - loose, supple, free-moving, very well balanced and 'up' in her carriage - a proper dressage pony! 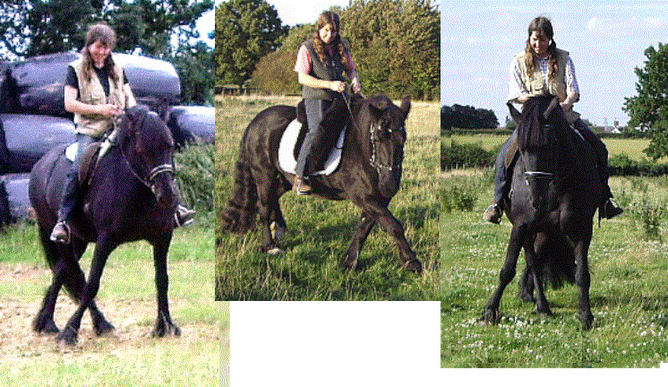 Her canter is slowly improving too, even before I start concentrating on it a bit more (I've hardly done any for ages). It's still a bit laboured on the left rein but she feels as though she's even starting to enjoy cantering on the right rein. She also looks much more of an athlete now. Her stomach muscles look much tighter and more defined and, to me anyway, she looks a really classy, uphill pony. I think what I need to start doing soon is going for a bit more duration in her trot work. It feels so brilliant that I have trouble stopping myself clicking after just a few strides as I get so excited by the feel she's giving me and so determined not to lose it. I need to start trusting that we both know what we're doing and know how to get back there, and spend more time playing with moving her between shortened and lengthened strides. It's all really exciting! Bella makes me feel like a proper dressage trainer and gives me so much confidence in what we're managing to achieve together. I've joked to people that my plan with her is to go into affiliated dressage at about Advanced Medium and work our way up! Who knows, it could happen yet!! !